Welcome to the podcast. We’re going to talk about cutting your per deal marketing costs. I watched an Eddie Speed video seminar today about creative financing, and I want to share it with you. The takeaway is to make several different types of offers on a property… give sellers options. Let sellers consider owner financing, maybe a lease option. Listen to the seller’s needs. Present several alternatives to them and more sellers will accept your offers. Sellers who have little or no equity are motivated, and there are plenty of them out there. If you have more offers accepted because you offer creative financing solutions, you’ve cut your marketing cost per deal. Voila. Hey, what’s up guys? Joe McCall, REI in Your Car. I’m going to show you how to get your marketing costs per deal back down to what they were three, four years ago. Are you ready? So, I was listening to a good friend of mine, Eddie Speed, and if you guys don’t know Eddie you should check out his, I don’t know if he’s on Facebook very much, but today he did a Facebook live video and I thought it was so good just to be reminded of the power of creative financing as he says. I like to say financing, he says financing. He’s from the south, really funny guy, super cool and very, very knowledgeable. He’s been in the business a long, long time and he’s really good. He’s one of the nation’s foremost experts on creative financing. And so, he was talking about this and it reminded me and I wanted to share it with you, just reminded me of why I love creative financing, why I love lease options. And a lot of investors, you know, they complain that marketing, their marketing costs have doubled over the last few years. Right? And I’m talking about doubling like before you used to spend a thousand dollars in marketing to do one deal and now, you’re spending two, three, $4,000 in marketing per deal depending on the market that you’re in. Which is a problem, right? Obviously, that’s a big deal. There’re some major changes going on and in fact in some markets and some of the biggest ones like Phoenix and southern California, parts of Florida, you’re looking at five grand in marketing per deal. Now they’re wholesaling deals their making 20, 30 grand on them, which is awesome. But it squeezing a lot of people out of the market and a lot of wholesalers are really getting nervous. So, where before you’d get maybe one out of every 20 offers accepted, what if you could get three or four offers out of every 20 accepted? And so, it’s a real simple formula. If the cost of marketing bill has gone up, if it’s doubled or tripled for you, do you know how to get it back to where it was back in 2012, 2013 and 2014? It’s really simple. You offer, you make more offers different. I’m not talking about quantity of offers like more sellers. I’m talking about making more offers to the sellers. So, if you’re talking to 20 sellers about 20 houses instead of just having a cash offer to give to them, why not give them a lease option offer or an owner financing offer, right? So that’s the beautiful thing about creative financing. It’s, it gives you, it gives you so many options, right? Because something’s happening right now in the market. A lot of cash buyers are pulling their money out of the market and they’re not buying as much as they were before or if they are, their prices are a lot less than what they were willing to pay before. I’ve talked to investors out in California and it’s insane, like they’re seeing a five to 10 percent drop in the ARV calculations that they’re rehabbers are using. Were before, if they thought the house was worth $500,000 fixed up and when they’re looking, when a wholesaler is when an investor’s looking at a deal to buy before they would look at it and say, alright, I’m going to sell this house for $500,000 when it’s fixed up. Now they’re looking at it saying I’m going to sell this house for 475 after it’s fixed up. Well, what does that mean for you? Well, it means that you’re just going to have to get in there and get it a lot less. But here’s the problem. There’s a gap in the market right now. Sellers don’t know the market like we do because we’re working in it everyday, right? Sellers still think their houses are worth $500,000, $400, whatever it is, right? They, they, they don’t know the reality of what’s going on in the market. Investors do, cash buyers and investors do. So, there’s this gap of the sellers don’t know that it’s bad yet, and buyers, cash buyers and rehabbers, they do know. So sometimes that takes six to 12 months for that to kind of balance out before sellers starting to realize, ah, you know, what prices are going down, they start getting more realistic expectations. So, there’s a six to 12-month gap. But what if you could offer the price that the seller wants for their house through creative financing, through a lease option or an owner financing deal. So, the formula is really simple. If you want to get your marketing cost per deal back to where it was in the glory days in 2012, 13, 14, you know back then. So, if you that had been around long enough know, you remember well it’s really simple. 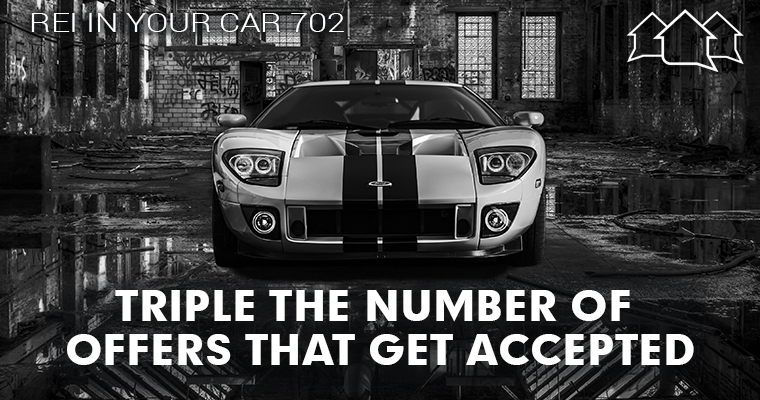 Make them different kinds of offers. So before, like a lot of wholesalers now you know, they’re getting one out of every 21 out of every 30 offers accepted at deep discounts for cash. What if you got three out of 20 offers accepted? Maybe for you talk to a seller, they’re just you’re just worlds apart from them. They want $200,000 for their house. You have to offer 150 in cash to make it work. What if you offered them 100, 200,000 like they want and see if they’d be willing to owner finance it or lease it for a period of time before you buy it and cash them out? There are so many different options like on a lease option, right? You can give them the price that they want as long as they give you the terms that you want. It’s either price or terms, so if they’re stuck on their price, then you can give them that price as long as it’s on your terms and maybe your terms are five years, maybe if it rents for $1,500 a month, you’re offering them a thousand a month. What if they. Here’s the beautiful thing about creative financing deals too whether it’s a lease option or owner financing, what if they want, they can’t do five years. Well okay, I could do three years possibly, but the price can be negotiated, can come down. The monthly payments can come down. Maybe the amount of money that you put down up front, your down payment or your option deposit, it goes down. What if they are stuck on that price? Like the rental, the monthly price, you know, if it rents for 1,500, they have to have 1,400 because that’s what their mortgage payment is. Well maybe you can get them 1,400 if they’re willing to owner finance or lease option instead of five years for maybe 10 years or if the prices were, if it’s worth 200, maybe you can get them down to 150, 170, something like that. Right? So, you can negotiate so many more things. If it’s a cash, there’s really only one thing to negotiate, isn’t it? It’s just the price. It’s the cash price and that sometimes is a non-negotiable for some people. But what if you could negotiate terms? So, here’s my advice, if you want to learn, if you want to be successful and profitable in 2019, 2020, and these next couple three years ahead, you’ve got to understand creative financing. You got to be an expert at it. You need to make offers. I’m telling you, the competition is fierce for traditional wholesaling deals. There’re tons of wholesalers out there offering cash, looking for the same few desperate few motivated sellers that have equity. Let me tell you something. There are a ton. I said this in my last podcast. There’s a metric buttload ton more sellers who are motivated that have no equity than motivated sellers that have equity, okay? There’s a lot of more motivated sellers out there that have little to no equity. Then motivated sellers that have a lot of equity and you look at the balance of all of the wholesalers that are competing for those fewer sellers that have equity and motivation and you compare that to the few investors that are marketing or targeting the sellers that are motivated to have little equity. Do you see how much easier and why it’s easier to do deals with you understand creative financing? So, here’s my point. Get out there. Start making different kinds of offers. Find out the seller’s situation asking what’s going on. Find out how quickly do they need their cash. If you can get them more cash, can they wait for it? What are they going to do if they can’t sell their house are, they going to rent it out? Well, would you rather me deal with the tenants and the hassles of managing a rental property or would you rather just deal with the tenants are yourself? Talk to sellers, give them options and you’re going to make a lot more money in this business. So, listen, if you want my book on wholesaling, lease options, kind of learn more stuff about like this. Go to WLOBook.com WLOBook.com. Get my book for free. Check it out. You just pay shipping and handling and I’ll get it out to you. As I’m recording this, I’m in the middle of updating my whole course. I’m going to be talking more about this when it comes to the market slowing down. If we’re coming into recession, I don’t know, but chances are things are going to start slowing down. I mean, our economy has been on a tear the last eight to 10 years. Things are going to turn around just normal market cycles, right, so some people are predicting it’s going to be really bad. Some people like the National Association of Realtors are always optimistic. It’s always going to be going up. It’s always going to be a good time. Well, whatever it is, whatever happens, I’m telling you this, things are going to slow down. 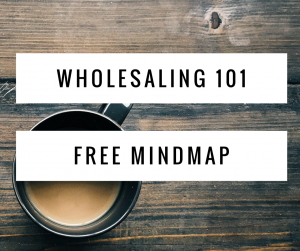 It’s not going to be as easy as it was to do traditional wholesaling. It’s getting harder and harder to do wholesaling. You can’t just be a one trick pony. You need to understand creative financing and lease options, so get out there and make it happen and get my book WLOBook.om and learn how to make these kinds of lease option offers to sellers. Okay. WLOBook.om. Also check out Eddie Speed. Just go to Facebook, look up Eddie Speed, look up his videos and he’s coming out with some good stuff. I’m going to be interviewing him soon on my podcast. I’m looking forward to it. Take care guys. We’ll see you. Bye Bye.